SECURE AND RELIABLE: This camera sling brings you convenience and efficiency. It helps you pick up the camera in seconds and make sure camera is safe and steady in even the most strenuous situations. It is so thin strap that you will never feel tired. This sling is breathable, to prevent you becoming hot while using it. ADJUSTABLE LENGTH: You can adjust the length from 21 inch to 30 inch in according to your own preferences freely. Ideal for both men and women. QBINGO Anti-slip Quick Rapid Carry Speed Sling Neck Strap with Rapid Fasten, Comfort, Ergonomic Design (women and men Universal). 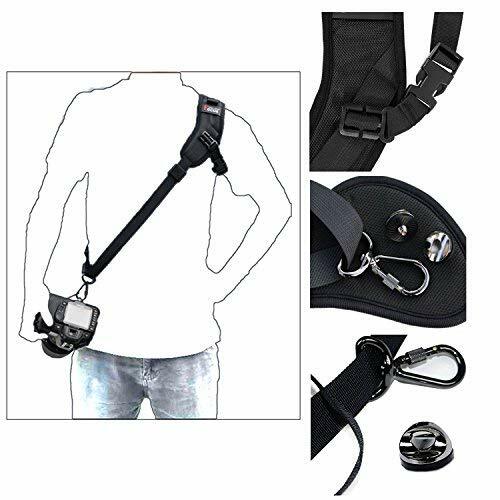 Whether you’re a professional on an all-day shoot, or an enthusiast on a family outing, this Quick Release Sling will make photography easy keeping your camera hanging ready by your side! It is perfect for all DSLR point-and-shoot mirrorless and compact video cameras. The Camera Strap is a lightweight strap and is the simple and versatile. With the Curve, ergonomics, it is designed and shaped to fit perfectly around your shoulder and distribute the weight evenly for optimal comfort and durability. The weight of your camera is evenly distributed for the ultimate in comfort. This Strap is worn diagonally across the torso from shoulder to hip, and adjusts to fit most photographers. The length adjuster is located inconspicuously at the rear of the shoulder pad. Once fastened the camera hangs upside down, resting securely at the photographer’s hip, stomach, or at the small of the back. The R-Strap system distributes weight sensibly, and contains dense foam padding for unparalleled comfort.